(Washington, D.C.—Dec. 4, 2018) ChinaAid Founder and President Bob Fu met with an advisor of Vice President Mike Pence late last week and urged Pence and President Donald Trump to personally intervene on behalf of John Cao, a North Carolina resident and pastor who is serving a seven-year sentence in China’s Yunnan province. The meeting between Fu and Nicholas J.C. Snyder, Pence’s Special Advisor for East Asia, Southeast Asia, and the Pacific, highlighted Cao’s case in hopes to secure his release. Cao was originally taken into police custody in March 2017, when he and his colleague, Jing Ruxia, were crossing the border between China and Myanmar, where they worked as missionaries. Even though Cao had made the crossing many times prior, with the knowledge of Chinese officials, he was arrested and sentenced to seven years in prison for “organizing illegal border crossings.” After his arrest, a Chinese-backed militant group began persecuting his fellow missionaries, who are still located in Myanmar, indicating that they all are being targeted for their faith rather than a crime. His wife and two sons are both U.S. citizens, and he pastored a Chinese church in North Carolina after moving to the States. Since becoming a missionary, he has established Christian schools for more than 2,000 impoverished minority children in Myanmar’s Wa State and is highly regarded in the area for his good deeds. 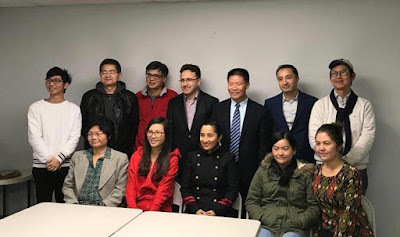 Through these events, ChinaAid hopes to further expose the abuses suffered by religious people in China and promote human rights, religious freedom, and rule of law.